The collaboration with GCU, a vibrant, innovative and multi-award-winning University for the Common Good, will ensure that The HALO, is at the heart of work-based education and skills building as it works to regenerate skills and industry in key HALO sites, while also providing young people with the opportunity to access employment and mentoring opportunities from key entrepreneurs around the world. GCU will play a key role in the design and provision of education that targets digital skills gaps, addressing employer need for work ready employees in the digital age. The innovative partnership between The HALO and GCU will identify the potential for dedicated learning pathways, including graduate apprenticeships, to build knowledge and skills through portable, accredited qualifications for HALO key, target sectors such as financial services, cyber security, energy and renewables (SMART Homes, sustainable cities and rural communities of the future), operations management, building technology, fashion business, consumer behaviour and engineering design and manufacturing. The partnership will also allow GCU opportunity to take its common good mission and pioneering social innovation approaches to the heart of the HALO regeneration communities. The partnership is being driven from all GCU campuses and at The HALO, an imaginative, innovative and inspirational regeneration initiative located on the site of the former Johnnie Walker bottling plant in Kilmarnock, East Ayrshire. The HALO is being shaped as a multi-faceted brown-field regeneration that will create a unique urban park with a dynamic commercial, educational, cultural, leisure and lifestyle quarter. Marie Macklin CBE, founder and Executive Chair of The HALO Urban Regeneration Company, said: “GCU provides world class education to thousands of students every year so I am really pleased that this partnership will support the HALO’s vision of providing young people with the skills needed to make an impact in tomorrow’s world. Marie, who was presented with an Honorary Degree from GCU on the 4 July, Independence Day in the USA, will travel to GCU’s New York City campus in October where she will provide a masterclass in Entrepreneurship and collaborate with the students and businesses in NYC, connecting with GCU’s Mission for the Common Good. 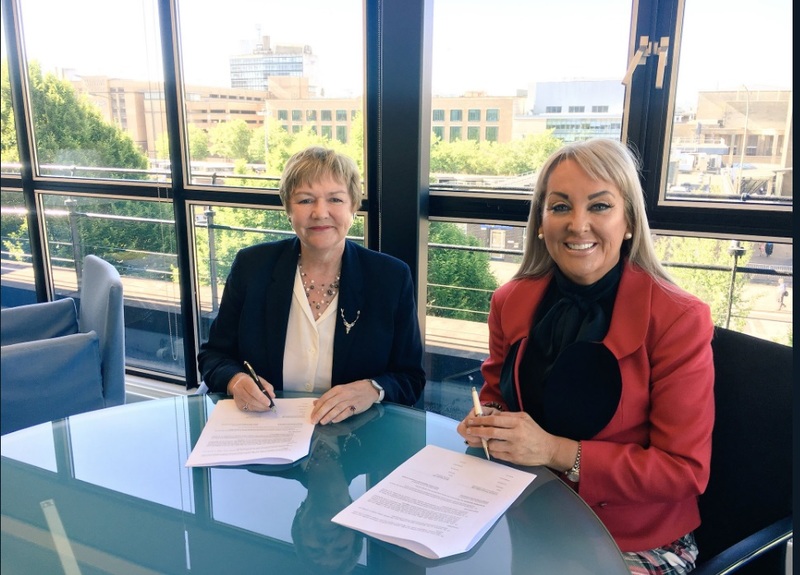 Professor Pamela Gillies CBE, Principal and Vice Chancellor of Glasgow Caledonian University, said: “We are delighted to have found a partner in Marie Macklin CBE and the HALO that resonates so powerfully with GCU’s mission for the Common Good and distinctive philosophy of work based education. We are keen to get started on our creative social, entrepreneurial and educational mission with the HALO and corporate partners to bring opportunity, skills, knowledge and transformational change to people and businesses at the heart of this project.